Restaurant Profile: Discover an Aurora restaurant that combines comfort food with a classy, white-tablecloth atmosphere, and find out how the owner’s dog holds a special place here. 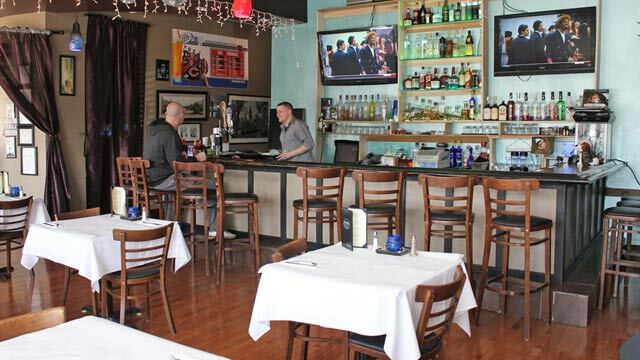 The casual bar and some of the linen-covered tables located inside Hounds Blue Moon, 2124 W. Galena Blvd., Aurora. Horacio Vazquez spent many years as a social worker, helping those with autism, Down syndrome and other disabilities. He switched careers midstream in life, attending culinary school and moving up the ladder to become a chef. He worked with the White Sox and Cubs’ organizations, at upscale hotels like the Hyatt and other exclusive locations. In April 2009, he opened Hounds Blue Moon at 2124 W. Galena Blvd., in Aurora. “I sort of knew what niche I wanted to put the restaurant toward – comfort food with a little eclectic feeling and a little bit of fancy,” he says. In addition to running the restaurant, Vazquez also offers catering services. Hounds Blue Moon offers an amiable atmosphere. Large windows let in lots of light. White tablecloths cover wooden tables with ladder-back chairs, and the bar offers a cozy spot for drinks while watching the game. Clientele can come in for intimate dates or large get-togethers, and specialties are offered throughout the week. One of the most popular is the Sunday brunch, with an omelet station, a carving station, eggs Benedict and other satisfying breakfast entrees and sweets. To add some entertainment, Vazquez is looking for local talent to play or sing during the weekly spread. Vazquez is excited about his brand-new menu, which offers choices like a shrimp po’boy, empanadas and sweet corn fritters, along with other appetizers, soups, salads, south of the border selections, pasta, white fish, barbecue ribs, pork chops, steak, even vegetarian choices. Vazquez’s personal favorites include Chicken Marsala and Chicken Vesuvio. He also loves the Reuben, because of the very tender corned beef he uses. Tuesday is the night to come for the restaurant’s specialty – stuffed burgers, served from 5 to 9 p.m. Vazquez has created 40 different types – all of which are offered each week – and he’d like to grow that to 50. He puts a little humor into the names of his concoctions; for example, the Forrest Gump is made with shrimp, rice and jambalaya spices. One of the most popular is the WTF, and although Vazquez likes customers to use their own imagination about what the acronym stands for, one thing they will find inside is fresh avocado. Patrons also flock to Hounds Blue Moon every Wednesday for Taco Night, where for just $1 per taco, they can choose from among seven types of filling, including steak, chicken, pork and cow tongue. Vazquez puts in at least 20 hours a day, sometimes seven days a week. Luckily, he has an understanding wife, Marianne, who takes care of their two basset hounds while he’s working so many hours. One howls at the moon – hence, the name of the restaurant. This entry was posted on Monday, March 19th, 2012 at 11:58 am	and is filed under Dining Guide. You can follow any responses to this entry through the RSS 2.0 feed. Both comments and pings are currently closed.